Magnets aren’t just for keeping lists and photos in place on your fridge – they also serve as some much-needed decoration. It seems as though the sky is your limit when it comes to choosing a design, however, and it’s pretty easy to become overwhelmed with your array of magnet options! Before your palms start sweating – don’t fear! 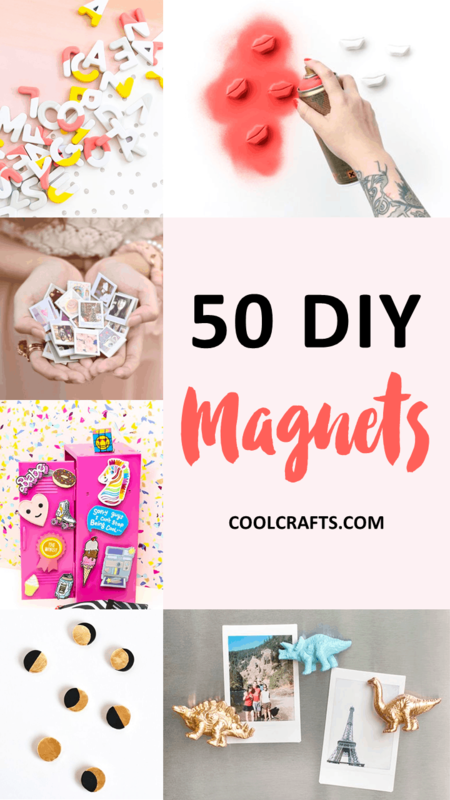 We’ve actually rounded-up 50 of the best magnets that you can make yourself. Not only will these save some coin, but they’ll also give you bragging rights for years to come! From crystals and metallic letters, to succulents, polaroids, buttons, and everything else in-between – there’s sure to be a few designs here that you’ll fall head-over-heels in love with. Let’s get started! The girls at A Beautiful Mess have created these awesome DIY cacti magnets to adorn your fridge. They’re perfect for fixing photos and important lists! Who knew that creating stylish DIY magnets could be as easy as using old tiles? Find out more by checking out the full tutorial on A Beautiful Mess! We love everything about vibrant agate slices, so imagine our excitement at discovering these DIY magnets from A Bubbly Life! Unique indeed. Here’s a fun but inexpensive DIY magnet idea from Alisa Burke – simply find some smooth pebbles and decorate them until your heart is content! If you’re a lover of crystals, then you’ll adore this DIY magnet tutorial from Almost Makes Perfect! These would also serve as gorgeous gifts for loved ones this Christmas. Everyone has spare buttons lying around at home, so why not turn them into colorful magnets? This tutorial from Big Box Detox is so easy to follow! Imagine having these pretty blooms in vases stuck on your fridge? Birds and Blooms created this tutorial and we have a feeling you’re going to love this idea! How awesome are these DIY back-to-school locker magnets from Brite and Bubbly? They’re colorful, fun, and have a whole lot of sass! Do you love all things pineapple? We sure do! Burkatron has created these DIY gold pineapple magnets to add style to any magnetic space. These adorable watermelon magnets are so easy to make – trust us, you’ll be surprised! Check out the full tutorial from Club Crafted for more. These DIY washi tape and image transfer magnets will entertain you all afternoon! You can even get the kids involved in making them too. Thanks Dear Handmade Life for the tutorial! Christmas is just around the corner (wasn’t that fast? ), so why not create these DIY Christmas inspired magnets from DIY Ready? The step-by-step guide will teach you everything you need to know! Mini succulents are so on-trend right now, and we have a feeling they’ll soon be taking over everyone’s refrigerator! Drawn to DIY is the clever crafter behind this project. These DIY glass tile magnets from Hello Wonderful are so vibrant – they’re sure to bring some much-needed color into your space! These delicious DIY magnets might look tricky, but the good news is that you’ll find a step-by-step video tutorial on how to make them via HGTV Handmade’s YouTube channel. Yay! Homey Oh My has created these fun-looking DIY fruit magnets and we think they’re incredibly cool! Which fruit is your favorite? If you’re a fan of vibrant colors like us, then you’re sure to love these DIY Pantone color magnets from How About Orange! What a clever idea. These DIY marshmallow magnets might look delicious, but they’re (unfortunately) not edible – almost fooled you though, didn’t they? Hungry Heart is the talented blogger behind this tutorial. Remember playing with those colorful plastic letter magnets as a child? Well here’s the sophisticated grown-up version of them, thanks to Inspired by Charm! Simply spray-paint them in gold to achieve this look. Fake flowers look oh-so-pretty when glued onto magnet backings, just like these ones from Jader Bomb. This is a DIY project you could knock-over within minutes! Is there anything you can’t do with watercolors? Lines Across has turned some plain magnets into these watercolor masterpieces and we’ve fallen head-over-heels in love with them! These geometric, color-dipped magnets from Lovely Indeed are just the thing to jazz-up your fridge! Paint them in a variety of colors or opt for a specific color scheme for cohesiveness. These brilliant gold and black magnets feature the different moon phases – isn’t that a wonderful idea? Find out all about them via the Make and Tell blog. Mer Mag is famous for its cute and quirky crafts and these DIY magnets are no exception! We love their little faces, don’t you? Add some pastel pink and gold rain drops to your fridge, just as Metro Mode has done! These are every feminine and beautiful. Bring the fun back into magnetic letters with these DIY ransom note letter magnets from Mod Podge Rocks. Too cool! She sells sea shells by the seashore – or at least, that’s what these DIY magnets from Mod Podge Rocks remind us of! They might look super professional, but you too can create these beauties. Love Tetris? Then you might adore these DIY magnets from Moms and Crafters too! Paint them in a variety of colors for an extra fun look. Does it get any better than these DIY pom pom magnets? Patchwork Harmony must love the fluffy little things as much as we do! Bring back Pacman with these DIY Pacman magnets from Plasters and Disasters. They’ll turn your refrigerator into a fun game! Donuts? On your fridge? To that we say ‘yes please!’ This video tutorial from Pudding Fish Cakes will show you everything you need to know. Speaking of culinary delights as magnets, Pudding Fish Cakes has also created a video tutorial to teach you how to make your own pizza heart magnets. Mama Mia! Wow, take a look at these DIY tangram magnets from Pure Sweet Joy! They’re not just pastel perfection, they’re also fun to arrange. Here’s something to do with those tiny fabric scraps you might have at home. Red Brolly has created these DIY magnets and we think they’re a great idea! Here’s another DIY letter magnet tutorial which will put a smile on your face. Sarah Hearts has painted hers for a color-dipped look. So pretty! Black and gold will always be a great combination, so these DIY magnets from Sara in Shanghai are sure to be on-trend for years to come. Looking for a cool craft idea using Scrabble tiles? Here’s one from Sincerely Kinsey where she turned them into magnets – fast and affordable! These decorated wooden slice magnets from Suburble look wonderful! They have a variety of pretty pictures on them too. You can also turn animal figurines into magnets by halving them, painting them gold, then attaching magnet backing to them. Too easy! Check out the full tutorial from Sugar and Cloth. Love polaroids? Turn your photos into miniature magnetic versions thanks to this tutorial from Sundae Sins! You can also turn maps into magnets, just as Surviving a Teacher’s Salary has done. Those white ornate frames are gorgeous too! Smack some lips on your fridge by following this DIY magnet tutorial from The Crafted Life. Aren’t they cool? Here’s another awesome tutorial for creating DIY mini plant pots, this time from The Merrythought. This is a great idea to add some greenery to your kitchen. Love druzy crystals? Imitate the look with these DIY druzy magnets from The Sarah Johnson. So glittery and glam! You can also add a bunch of your favorite emoticons to your fridge by following this tutorial from The Surznick Common Room. These won’t take very long to make either! Get inspired by Conversation Heart candy by creating your own DIY magnet versions. Thanks to This Heart of Mine for this loved-up project idea! Love embroidery? Turn your fabulous designs into magnets the easy way! Be sure to check out this DIY tutorial via DIY Candy for more info. Here’s some more unique DIY magnet designs found via The Wonder Forest. It just goes to show that your creativity and imagination is certainly not limited with this project! Turn some rocks into magnificent galactic versions by painting them black and sprinkling them with gold glitter. We Heart This has the full tutorial for you! You can even turn vintage brooches and jewels into magnets, just as What Meegan Makes has done! This is a great way to display an impressive collection. There you have it – 50 of the best DIY magnets to make for your fridge. Which designs did you like the most? We’d love to hear from you in the comments section below! Thanks for including Pure Sweet Joy’s tangram magnets!